Paradox: a person or thing that combines seemingly contradictory properties. Cancer has introduced a universe of paradoxes into my life. One of the most perplexing is the exercise vs. rest paradox. We are told that exercise is important, one of the few potentially preventive measures we can take to help avoid a reoccurrence. We are also told that it’s important to give the body time to recover because surgery and associated therapies take a hefty toll. My surgeon was unwilling to do any further work last year because I’d already exceeded my quota of anaesthetics and treatments. I thought I was recovering reasonably well and had no qualms about more major surgery. She strongly advised against it so we agreed to pick up where we left off when we meet each other again later this year. Last September I had yet to discover that chemo ages the blood by up to 15 years in a process that may well be irreversible. I anticipate this falls into the ‘unintended consequences’ category of chemo-related side-effects but it means my blood is now old enough to qualify for state pension! The rest of me falls some way short and will do for over two decades. Aged blood can, apparently, be problematic. The same is true of untreated cancer. In spite of geriatric blood, the risks associated with more surgery and the unavoidable recovery period that accompanies it, my mind is made up. NHS permitting, the remaining work will be completed before the end of this year. I fully expect the chief executive of the health care trust to have to approve provision of more acellular dermal matrix even though he knows nothing about its essential role or my surgeon’s requirements. The approval is another bean counting exercise; a few inches of ACD significantly increases the cost of a surgery that is already well in excess of £5k. Cost vs. care – another cancer paradox. The time between now and my date with a(nother) hospital stay offers an opportunity to build some fortifications. Being fit for surgery means being well prepared physically and mentally. I’ve noticed little attention seems to be paid to state of mind; often the focus is on physical attributes like BMI and blood pressure. These are important but I think it’s remiss to neglect the mind because it can affect the body, especially pain and recovery, and vice versa. There’s no doubt that I get more physically and mentally tired these days than I ever did before the cancer chaos. What else can I expect when my blood is over 60 and still perniciously anaemic? There’s also no doubt the stubborn streak that saw me through treatment remains stubborn enough to make me finish important tasks at home and at work even if I’d rather collapse in a heap on the floor. I am, however, better equipped to listen to my body and to the frazzled walnut that rattles around inside my skull serving as a rudimentary brain. Pace is everything and that doesn’t mean doing everything like a sprinter! I was never good at short distance races even as a teenager so my chances of improving that now look very remote. Endurance was a better option so while I’m working to improve BMI, physical stamina and agility I’m also using the time to recharge mentally and emotionally. I’m fairly resilient however I know returning to hospital for elective surgery will bring back memories I’d rather not dwell on. The corridors, smells and various sharp instruments act like the black and yellow stripes on an angry wasp. Instinctively I’d prefer to be nowhere near it and no matter how well prepared, I’ll never relish the thought of more surgical drains. All of these things are inevitable in order to do as much as I can to reduce the likelihood of another episode of unwelcome cancer. Needs must. So I’m back walking the coast path photographing flora along the way as a means to create another reality, one that holds the strength, silence and serenity to carry me through what lies ahead. That’s going to be yet another paradox. 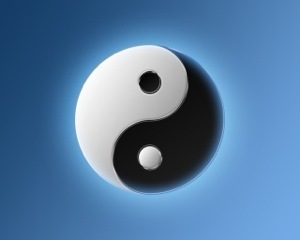 The yin (shade, darkness) and the yang (light, sunshine) are opposite and interdependent, constantly changing, sometimes more one than the other and on occasion, one engulfed within the other. Mercurial, haphazard, in perpetual motion and full of contrasts: light and dark, day and night, happiness and sorrow. Our lives embody the yin-yang and for our part we must learn to adapt, knowing that bad times will eventually give way to good. As a reasonably optimistic person I live in hope that any periods of yin in my life will eventually give way to yang and on the whole that’s what happens. Living with someone who is suffering from fairly severe depression calls the whole yin-yang into question though and at present I’d appreciate a bit more yang and a lot less yin in my son’s life. When someone develops cancer it’s immensely difficult for them and for their family and friends. As well as being a distressing sometimes frightening experience, family members often feel helpless because they believe they are unable to do anything that will change the situation for the better. Clinically this is likely to be the case but spiritually and emotionally it is not so. I know this all too well as I’ve been on both sides of the cancer fence, patient and family member. I now know the same sense of helplessness can be true when sharing your life with someone who is struggling with depression. Watching a person you love withdraw from the world, continually question their worth and slip into thought patterns that hold no glimmer of hope or positivity is extremely challenging. Emotionally it’s very draining and this is especially so when you think you’ve turned a corner only to find yet another brick wall shrouded in darkness. That darkness is insidious and as a parent it chills my heart because I have no way of knowing how long it will continue or how much darker it might get before some daylight eventually creeps into my son’s most desperately unhappy episodes. Though he is making progress (we both thought the worst might be over) it seems minor incidents continue to throw him back into the void. Often that journey is highly traumatic and when he goes back to the darkest place we have to start again from the beginning, covering old ground and having the same conversations. “Life is unfair,” “why do bad things happen to good people?” and “how come nasty people make other peoples lives a misery without consequences?” are regular features of our cyclical, circular communiques. It takes a significant amount of rational discussion and sound reasoning to help dissuade these views once they’ve taken root and I am not always successful. When I explain with clinical precision that fairness, bad things or nasty people are simply concepts and value judgements i.e. they are all made up, the message sometimes strikes a chord. Illustrating that life is a series of events to which we attach meaning, meanings are subjective and intangible thus fair/unfair, good/bad or nasty/nice can only ever exist in our personal view of the world occasionally comes across as off-beat or plain weird enough to provoke a degree of confusion and in doing so lets a sliver of light reach in. I seem to serve as a constant reminder that a caterpillar sees only the end but for the butterfly life is just beginning. It takes patience, time and unwavering commitment when we’re having the same conversation for the two-hundredth time. I’m not a psychologist. I have no real idea how to help challenge the spectre of depression yet I feel compelled to do so. Something primordial whispers do whatever it takes, prevent it gaining so firm a hold that it might never let go… because deep in my own psyche lies the thought that it might not let go. In those moments I think of the caterpillar. There is a period of complete chaos where it is nothing more than cell soup inside a paper-thin wrapper. During a few weeks metamorphosis it’s yin is transformed by the developing yang and then, almost miraculously, a butterfly breaks free. Life is once again in order and it has chosen a new and vibrant shape. No trace of the caterpillar’s doom remains to be seen. This, I have to hope, is what lies ahead. In the meantime, patience and tenacity prevail. Twenty-two months towards the road less travelled. It’s twenty-two months since I was diagnosed with aggressive HER2+ breast cancer. Since then so much has changed. How many of the changes might have happened anyway, even if I’d not been exposed to the world of the cancer patient? I know for sure the treatment related changes would all have been avoided but I’ve been exposed so there’s no escaping the fact that medically I’m a recovering cancer patient and have the scars and related issues to prove it. In three years time I aim to be classified (medically) as an ex-cancer patient, I hope the scars will fade and the side effects will subside by that point in time. The term relapsed cancer patient is not something I aim to become familiar with so the two-fingered salute is for you epigenetic factors, oncogenes and transcription errors. Keep the hell out of my cellular processes because you are not welcome there or anywhere else for that matter. 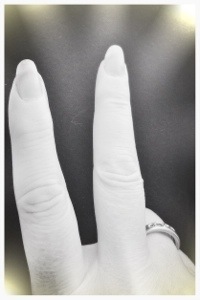 My finger nails are almost as good as before and I intend for them to stay that way. The same goes for my hair. Whilst some of the changes of the last twenty-two months have been unavoidable, others have been a conscious and positive choice. I enjoy meat but am now almost totally vegetarian; extensive research into the implications of cheap meat production led me to conclude the risk to my future health outweighs the fleeting pleasure that comes from a decent steak. I really don’t miss it and if I have the occasional unquenchable yearning then its a rare enough event to have no influence on my genetic make-up. I once enjoyed wine (and beer) but again the potential risks involved in more than the minimal intake coupled with months of being alcohol-free seem to have curbed my liking for it. Even if I decide to have a glass I don’t enjoy the taste these days and alcohol is expensive so the money I save helps pay for other things. I sleep more. Deliberately. The science of cell malfunction is complicated but we know for certain sleep deprivation leads to increased levels of cell mutation and cell mutations can lead to cancer. Gone are the days of 5 or 6 hours sleep per night. I also get out more, into the garden or walking (in spite of ongoing joint and nerve issues that serve to remind me of Taxotere and Herceptin) and I take vitamin D because most people in the Northern Hemisphere never get enough sunshine. I work hard but not endlessly, relentlessly or in the completely self-sacrificing manner of my pre-cancer life. During the week (and at weekends if he wants company) I live with my son. We’re 40 minutes from the university – far enough to put the day’s events behind us when he returns from lectures and I return from work. Living together today doesn’t make up for the years I spent working in distant cities staying in soulless hotel rooms, but its still special and we’re at a point in our lives where we’re friends as well as mother and child. We live a quiet, harmonious existence laughing at the silly stuff and talking through any serious matters until we find a way forward. We study together, or rather he studies and I try to keep up so I can help with revision. With focus and good final exam results it looks likely he’ll realise his dream and go to medical school in 2015. I’m pleased he retained this ambition in spite of the carnage of the last two years. My life now centres on living in the moment. I appreciate the time I have and the people I spend it with. I only fret over things I can do something about and I do something about them to negate excessive worrying. I keep no pacts with fate or destiny and I don’t assume some bright and brilliant future lies in wait for me. I accept it will be whatever it turns out to be and trust I’ll find a way to deal with it as required. In spite of everything that’s happened I don’t resent cancer; it’s just something that happened. That doesn’t mean I’d welcome it back into my life and I now know the same is true of excessive hours, an unhealthy work-life balance, sleep deprivation and regularly being away from home. It seems some good can come from almost any situation, including those that derail the life we once knew. Twenty-two months of change has driven me to chose the road less travelled. Though there are bumps along the way, I suspect its a happier and healthier road overall.